With the Stars is a Toronto Star column written by Helen Sawyer Hogg from 1951 to 1981. There is already a growing archive of RASC publications dealing with issues of interest to members of the Society, but what about information intended for the public? Between 1951 and 1981 Helen Sawyer Hogg wrote a weekly astronomy column for the Saturday edition of the Toronto Star, usually titled With the Stars. The purpose of the feature may only have been to update readers on the most obvious celestial events, but Dr. Hogg's column was an eclectic blend of backyard observing notes and astronomical news stories, with both local and international angles. Now, for possibly the first time a complete index to the feature has been compiled. With the Stars also laid out stories from astronomical history, such as the Great Meteoric Procession of 1913, the Foucault Pendulum, and Comet Biela. In 1976, Dr. Hogg's introductory astronomy book, The Stars Belong to Everyone, was based in large part on her writings for the Star newspaper. 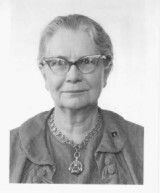 As the founding president of CASCA and an astronomical journalist in her own right, Helen Hogg frequently summed up papers she had seen presented at international conferences of the American Astronomical Society, the International Astronomical Union and several RASC general assemblies. Helen Hogg's tenure on With the Stars was in fact an extension of the feature after the passing of her husband Frank, who wrote for the Star while he was the director of the David Dunlap Observatory. Frank had himself inherited the feature from Peter Millman, a DDO astronomer who contributed astronomy columns to the Star in between his graduate studies and war work. Millman went on to work at the Dominion Observatory in Ottawa, at which time he struck up a new astronomy column at the rival newspaper, the Toronto Telegram. When Helen retired from the Star's pages in January, 1981 the astronomy column was picked up by Terence Dickinson, who continued as a columnist for many years afterwards. Archiving of these other features can be expected in due time. Microfilm archives at your nearest large library ought to contain spools of the Toronto Star for all of these dates, usually accessible for free. For a nominal rate, you can access the Toronto Star archives online at pagesofthepast.ca. Please do not reproduce materials without permission.